(Stafford Springs, CT)—The Valenti Modified Racing Series made its second and final visit of the 2018 season to Stafford Motor Speedway on Friday, August 31st for the 9th Annual Lincoln Tech VMRS 80. Richard Savary took the lead on lap-26 and led the rest of the way to score his first career win at Stafford Motor Speedway. The race took the green flag without VMRS points leader Anthony Nocella, who blew his engine during his qualifying heat. Chase Dowling took the lead with Jeff Gallup following him around polesitter Joey Cipriano at the start with Anthony Flannery fourth and Dave Etheridge fifth. The caution flew with 9 laps complete for a spin coming out of turn 2 by Steve Masse. Gallup nearly took the lead from Dowling on the restart but Dowling held him off. Richard Savary was up to third with Ronnie Silk up to fourth and Joey Cipriano fifth. Anthony Flannery did a 360 spin in turn 2 but kept going and the race stayed green. Woody Pitkat was on the charge, as he took fifth from Cipriano and nearly had fourth from Silk before settling back into line. Savary got around Gallup for third as Dowling continued to the lead the race with 20 laps complete. Silk went around Gallup to take over third on lap-25 while at the front, Savary took the lead from Dowling on lap-26 with a pass coming out of turn 2. Pitkat was fifth behind Gallup with Cipriano sixth and Etheridge in seventh place. Dowling started to slide backwards on lap-29 as Silk took second, Gallup third, and Pitkat fourth with Dowling slotting back into line in fifth place. At the halfway point of the race Savary was still out front with Silk, Gallup, Etheridge, and Pitkat all giving chase. Dowling was sixth with Cipriano, Sam Rameau, Andrew Molleur, and Dan Meservey, Jr. making up the top-10. Gallup was starting to apply pressure to Savary on lap-55 and he nearly made a pass for the lead on lap-56 but had to fall back into line behind Savary as they navigated lapped cars. With 10 laps to go, Savary was still out front with Gallup and Etheridge right behind him. Eric Goodale had worked his way up to fourth with Pitkat in fifth. Silk was back to sixth with Cipriano, Rameau, Mike Willis, Jr., and Molleur making up the top-10. 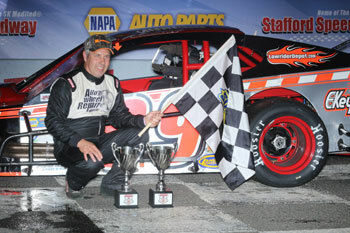 Savary led Gallup and Etheridge to the checkered flag to pick up his first career win at Stafford Motor Speedway. Goodale finished fourth with Pitkat rounding out the top-5.